"Clinical Trial and Error" & "How Stella Got Her Groove On"
A brief note from the recapper: In an effort to catch up with my recapping schedule, because I’ve gotten somewhat behind (thanks, college), I’m going to keep this combined recap short and sweet. But enough about my life. Let’s get back to Stella’s. I’m surprised at how much I genuinely enjoy the show so far. Yes, there are moments where I am bored by storylines, or confused at inane jokes that gets wrenched into otherwise compelling conversations where they have no business being. 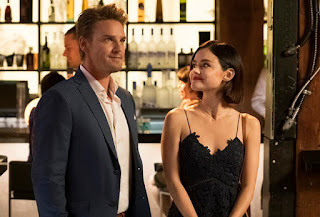 For example in episode three, when Aiden and Paul go to a bar to meet women, and they run into some awkward hijinks involving Paul and a woman not much older than his daughter. Or in episode four when Stella finds Wes skyping a co-worker abroad in the U.K., in the bathroom, in his boxers. These situations are so weird and unnecessary. I mean, that killed me. It was in the moment and it was silly; yet it fit. The same thing goes for Aiden, a character who is meant to be the constant punchline. He comes off as a natural goofball. Stella is funny too, Ida is, Diego, and Paul — it’s not that these characters aren’t capable of comedy or lightheartedness, because they are. I emphasize that in a serious show such as this one, where the premise revolves around a girl and her recovery from a life-threatening illness, comedy is necessary to add depth to the storylines and the characters. It makes them human and relatable. It’s really because these characters are organically funny that jokes like what I detailed above are highly unnecessary to drive the charm of this show home. Indeed, there are moments — lovely, sweet, simple moments — that absolutely overwhelm and engage me as a viewer. In episode three, that was the heartfelt family bonding between Wes, Diego, and Ida, Aiden and Paul, and Stella and Aiden. See, that’s what I want to see more of. I want to see Wes and Diego be brothers-in-law together and understand more about who they are; we still know next to nothing about why they are where they are in their lives, and I know it’ll take a while, but I think it’s through the connectedness of this family that the story develops. I want to see Ida be with her family, and I mean truly be with them, instead of on the sidelines with Poppy. Because God, that’s where she shines. Gillian Vigman is a talented actress and wholly compelling in her confessions, and I need to see more of that and how her experiences raising Stella completely changed how she perceives the world. That moment in episode three — where she breaks down in front of Wes because she realizes that she freaks out when her grandchildren have a mild fever is connected to her still existing worries about Stella — was heartbreaking. To me, that conflict is real. I have the same relationship, the same back-and-forth with my dad. Thus, these are the moments where I’m the most absorbed in the show. It’s when the plots, the characters, and the emotions that they’re making me experience are something I can relate to. Because this isn’t a sci-fi show, because this show is so grounded in reality, it’s the relatability that keeps me coming back to watch it. I don’t need vampires, or werewolves, or unrealistically attractive, bulky men to keep me interested. I’m glad that they began to flesh out Aiden a bit more in episode four. With the prospect of being a father, we see Aiden make an effort to grow. In the end, it turns out that Marlene’s baby is not his, but just for a minute he had a purpose and he craves that. It was an emotional moment, when he unravels from that shock, but Life Sentence let him be emotional and I found it to be one of the best parts of the episode. All I need to see as a viewer is that my humanity is being depicted on TV, and is being depicted well, in a way that is personal to me and to everyone else watching. I see this humanity in the moments I described, and no matter if the show is canceled or renewed, I’ll be a fan if I get to see a family’s love and healthy bond represented well. As for Stella and Wes, I think that they have one of the most interesting relationships on the show. They’re love is young and built on lies, therefore it’s rocky, but boy is it pure. If only the writers would stop giving them dramatic and needless obstacles, we could see them grow together, in the unique position they find themselves in. I don’t want to see the doctor from the hospital try to make moves on Stella and upset Wes; I don’t want to see Wes and Stella not communicate about their problems, as we saw in episode three and four. Though I get that these tensions are necessary because it shows that it’s necessary for them to learn from these mistakes and try to move forward together. I only wish that they get the chance to do so. I tried not to bust out laughing at that line during a quiet plane ride, and cause a scene. I did anyway. Paul is the most accurate depiction of a dad/professor I’ve ever seen. Does Wes have a job? Not that it matters but also it does? Can we, as an audience, get to know Poppy more? Please? "Hey, how’s your night out on the town without me going?” Oh my God, Wes is clingy like me. That’s cool. I will never understand why people in TV shows and movies locate people in social situations via telling time. “Modern women want a man who can communicate, be vulnerable.” Aiden’s been watching Queer Eye. This Grant guy looks evil. He’s like, trying to do an impression of Sam Rockwell, or something. I loved the bonding between Wes and Ida. It warmed my heart. The politics of clinical trials/healthcare bureaucracy is so interesting. And I like that it’s being discussed, because it makes the show more real, gives it depth, and makes the story accessible to everyone. “I think it’s a little demeaning to have a 20-year old as a boss.” I agree, and I’m 21. For being so proactive about her life, Stella is very passive about destiny. “That makes you my sugar mamma.” Ah, flipped gender roles. I think Stella’s relationship with her boss at the coffee shop would’ve been a lot better if she hadn’t spent her entire first day revealing a lot of personal information to her when she was supposed to be doing her job. “I run a multi-level marketing skincare company, but I just can’t live here by myself” Okay, Marlene, I sympathize but also how is an adult capable of starting and running a successful (given the amount of wealth she has) business unable to be on their own? How, I ask? “What is kickball?” Hm, think real hard about it, Wes. I’ll wait. Why did Stella and her grade school friend recite each other’s full names when greeting each other? That’s so weird. “Sub particles are kinda my jam.” Woah, don’t make me watch The Big Bang Theory. How is Stella’s friend a physicist? How does she already have her master’s or PhD.? How old is she? “My inner monologue’s pretty fierce.” Same, Stella. Women in real life usually take off their makeup before going to sleep because they don’t want to break out. I guess women in TV shows like to play fast and loose and take their chances? Aiden in a button up and khakis looks like a completely different person. The dress that Stella wears at Marlene and Aiden’s dinner thing is so pretty. “There’s a difference between failing and being a failure.” I agree with this distinction. I like that Sadie doesn’t operate as a catalyst for Stella’s actions. Instead she’s a motivator and Stella gets to be an actual caretaker.